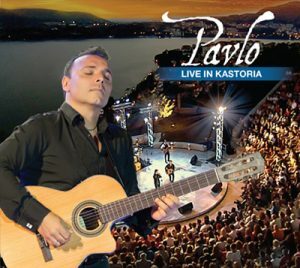 The concert was on top of a mountain overlooking the city of Kastoria, in Northern Greece. It was a Once-in-a-lifetime opportunity to bring my music to the place that has nourished my soul even before I was born. This is where my family is from and to have my mother and father in attendance made me feel so blessed. A memory I will cherish forever. I was fortunate to share the stage with some of the most incredible musicians on the planet. My special guests include Remigio Pereira of The Tenors where he sang in great TENOR fashion, an old classic “Acropolis Adieu” and he also joined me on guitar to perform “Alma del fuego”, a song off our collaboration album, “Guitarradas”. G. Pinto was on violin and we performed a song we co-wrote “Sweet Arabian Fantasy”. Lazos Ioannidis played the magical Lyra on “Seleni”. Tasos & Tasoulis Valkanis joined us on trumpets for ” Cuban Brass Cowboy”. Lastly, Vasilis Gkouletsas executed a flawless Zembekiko dance routine to “Broken Plate”. My Band comprised of Gino Mirizio (percussion), Dimitrios Bogris (Bouzouki) and Curtis Freeman (Bass) are the gentlemen that back me up every night. These guys are so good that they are each worth the price of admission alone. We’ve toured the world together and I thank them so much for joining me in this Once-in-a-lifetime concert.